Join myself, Canadian Champion Daniel (ChunkyGorillas) and Jonathan (AussieJedi) for our new podcast for the Star Wars Living Card Game. Episode 2 will include a spoiler objective set from Between the Shadows. Just beginning and already treating us with spoilers? You're too kind, good sir. Seriously though, I've been waiting for this and it's neat to see it's finally up. Saturday night just got a little brighter. how often are you planning on putting these out? Yeah was awesome of FFG. Plan was for biweekly but we will be recording again this week since we got the spoilers from FFG for Between the Shadows and want to get them out to everyone. It was pretty fun to do this with Matt and Dan. The game needs more dedication to rouse up some more excitement. It was a great experience and I hope that we can keep on going strong. Any feedback is appreciated. Will the spoilers be Scum or Jedi? What about a little teaser ? Please? Pretty please ? You know that we are all starving for news. It is a Scum & Villainy objective set. It is Zekka Thyne's set called All Out Brawl. 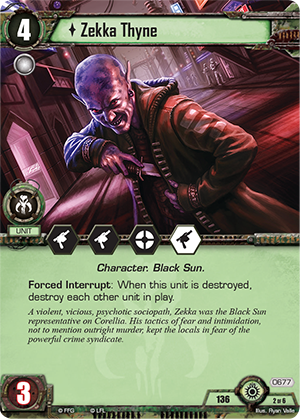 Zekka was previously spoiled by FFG. Work in progress. Soon as I am able to successfully create it will add it to first post. Thank you! Really looking forward to see the entire set! I was amazed to hear a lot of love for the Communications Officer. Didn't know anyone actually played that set. Even if you do enjoy the set, I can't see anything good about comm officer. One of those cards I just don't understand. It's sad Navy Vader is in such a silly set. I want the spoilers for the Navy Troopers set. Someone make it happen! No love, FFG. No love. Kind of ridiculous at this point.